By default, Insight exports the fault sticks to the GeoQuest IESX format (.dat file extension). If you have defined a velocity volume for time/depth conversion (see Converting Time-Depth), you can export the fault based on the time/depth domain. In the tree, right-click the fault you want to save/export and click Export. The Export Fault window will be displayed. You can select more than one fault in the tree, right-click and select Export 2 faults (if you have selected two faults in the tree) to export multiple faults to a file. In the Export Fault window, select TWT (ms) to export the fault in the time domain or TVDSS (m) to export the fault in the depth domain. You can only do this once you have defined a velocity volume for time/depth conversion (see Converting Time-Depth). Type the file name for the fault(s) and click Save. Note: It is possible to export both the unassigned as well as the assigned fault sticks. During the export of an assigned fault, Insight will write a file containing the fault sticks and also a GoCAD TSurf file (.ts file extension) containing the tessellated fault surface. When you import the resulting file in Kingdom, you should specify the format as GeoQuest IESX11 in order to edit the faults. 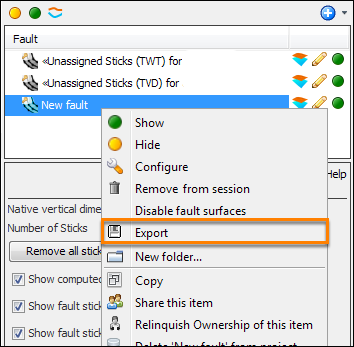 Note: For more information on exporting a fault as a GeoQuest IESX or a GoCAD file, see How do I import or export faults?